Comic books as a method of missionizing for Islam (da'wa)? Yes. One year ago, Harvard University hosted a workshop to teach comic book artists how to address Americans' "unease with Islam and the Middle East." And later this week, Georgetown University will air a PBS documentary, Wham! Bam! Islam! celebrating a comic book called The 99. The 99 sounds innocuous. Adweek describes its topic as "a team of multinational superheroes [who] band together to fight the forces of evil." The American children's network Hub more fully explains that, "Created by noted Middle East scholar and clinical psychologist Dr. Naif al-Mutawa, [it consists of] superhero characters who must work together to maximize their powers. Each member of The 99 embodies one of 99 global values such as wisdom, mercy, strength or faithfulness, and they hail from 99 different countries on seven continents. The series' superheroes portray characters designed to be positive role models, representing diverse cultures, who work together to promote peace and justice." Who can object to the promotion of "global values … representing diverse cultures"? But a closer look reveals the Islamic nature of the comic book. The title, 99, refers to Islam's concept that God has 99 names, each of which appears in the Koran and embodies some attribute of His character: the Merciful, the Compassionate, the Kind, the Most Holy, and the All-Peaceful, but also the Avenger, the Afflicter, and the Causer of Death. The comic book, produced by the Teshkeel Media Group of Kuwait, tells a partly-factual, partly-fantastical tale that begins in 1258 A.D., when the Mongols besieged Baghdad. Librarians supposedly saved the wisdom of the city's main library by encoding it in 99 gems that get scattered around the world. The heroes must find these "gems of power" before an arch-villain does. Each of them is an ordinary Muslim who, through contact with a gem, achieves superhuman powers and represents one of God's 99 attributes. The superheroes are all Muslims (i.e., not Christian, Jewish, Hindu, or Buddhist), some of whom come from Western countries like the United States and Portugal. In contrast, villains are primarily non-Muslims. Al-Mutawa describes contradictory goals for The 99. Sometimes, he insists "I'm not looking to convert anyone." In this mode, he hopes "Jewish kids think that The 99 characters are Jewish, and Christian kids think they're Christian, and Muslim kids think they're Muslim, and Hindu kids think they're Hindu." At other times he says he devised the series on concluding that "the Arab world needed better role models." 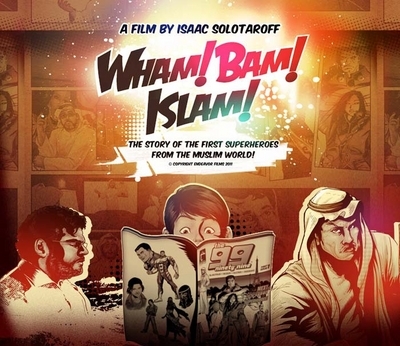 He aspired to develop "a new cast of superheroes for the children of the Islamic world" and hoped his work "may well help save a generation" of Muslims. He even thinks his cartoon characters can "salvage Islam's reputation." Indeed, discussion about The 99 stresses its Islamic component. The New York Times notes that its superheroes are "aimed specifically at young Muslim readers and focusing on Muslim virtues." The Times (London) described the series' mission as instilling "old-fashioned Islamic values in Christian, Jewish and atheist children." Likewise, Barack Obama praised the comic books for having "captured the imagination of so many young people with superheroes who embody the teachings and tolerance of Islam." An Islamic investment bank whose products "fully comply with Shari'ah principles" invested US$15.9 million in Teshkeel and complimented it for "highlighting Islam's rich culture and heritage." The cover of the comic. 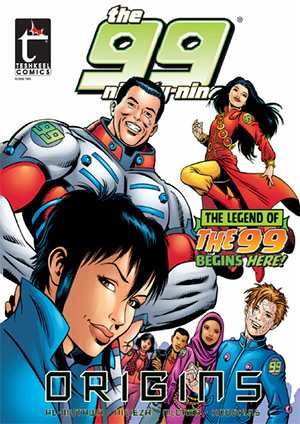 In short, The 99, available in both Arabic and English, contains overtly Islamic content and explicitly promotes Islam. Granted, its Islam has modern aspects, but among non-Muslims the series engages in surreptitious da'wa. In addition to the comic books, Al-Mutawa has developed some spinoffs (online comics, games, lunch boxes, and theme parks) and envisages others (newspaper comics, stickers, and perhaps toys). But most of all, he wants an animated cartoon. 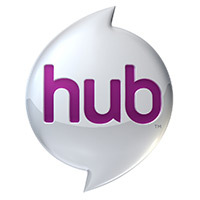 Although the Hub network planned in 2011 to air The 99, this never happened, largely because criticism caused it to shy away from a show instilling "Islamic values in Christian, Jewish and atheist children." Five of "The 99," from left: Mumita (speedy), Dr. Razem (a gem expert), Rughal (mystery powers), Jabbar (expandable) and Noora (sees truth). In short, to the Islamic indoctrination of Western children, already present in schools through textbooks, additional school materials, and classroom trips, now add comic books and their many spin-offs, actual and potential. The 99 might be fine for Muslim children but, support from Georgetown University notwithstanding, non-Muslim children should not be exposed to missionizing propaganda of this sort. Mr. Pipes (DanielPipes.org) is president of the Middle East Forum and Taube distinguished visiting fellow at the Hoover Institution of Stanford University. © 2012 by Daniel Pipes. All rights reserved. Sep. 7, 2012 update: Marvel Comics has added a Muslim Arab-American superhero to the Green Lantern series. He's Simon Baz, an out-of-work automotive engineer turned car thief who joins the intergalactic police force. He does not seem to have a da'wa agenda. Mar. 24, 2014 update: The Saudi Permanent Committee for Scholarly Research and Ifta has banned The 99 because "People who want to teach others about god's attributes should use legitimate ways." Al Mutawa replied: "I never thought they would go as far as accusing me of blasphemy and atheism." Related Topics: Islam, Muslims in the West | Daniel Pipes receive the latest by email: subscribe to the free mef mailing list This text may be reposted or forwarded so long as it is presented as an integral whole with complete and accurate information provided about its author, date, place of publication, and original URL. CAIR Official: "i wish hitler was alive to f*** up the jewish ppl"
Netanyahu Promotes "Principle of Victory"
Mecca and Medina, Sacred Sites or Development Engines? Who Is Sisi of Egypt? A Salafi. Who Is Sisi of Egypt? A Reformer.